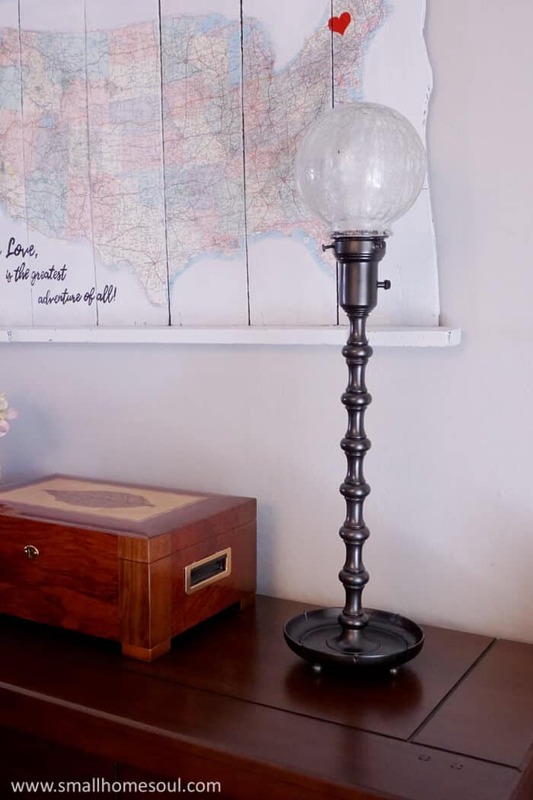 How to Makeover a Brass Lamp with Paint - Girl, Just DIY! 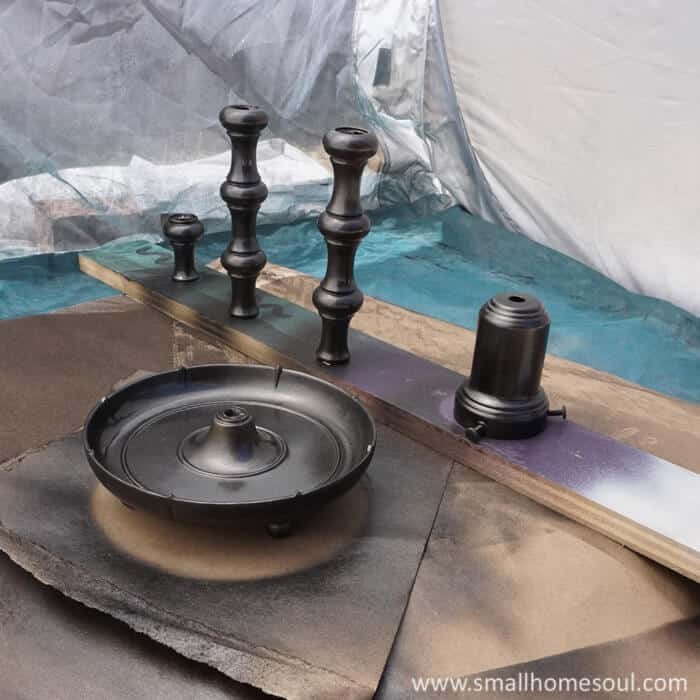 Painting over a tarnished piece of metal requires a little prep. 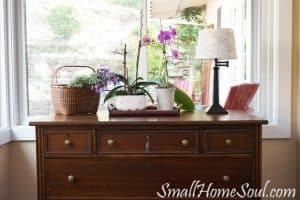 I’ll show you how to prepare a grungy, tarnished, brass lamp for a beautiful makeover perfect for any decor. I arrived early for my chiropractor appointment a few weeks ago and to kill time I ran to the Teen Challenge Thrift Store across the street. You never know what you’ll find there. Usually the smaller items have no price tags so you have to wait until you get to the counter. I gathered a bunch of stuff that was interesting and negotiated $15 for my haul. Mostly because it was all the cash I had on me. 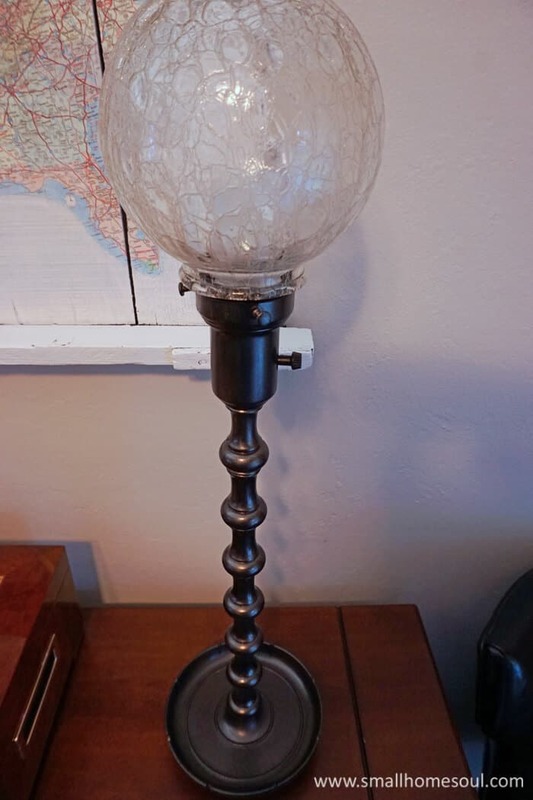 Included in the haul was this very grungy lamp that was missing a globe. This baby needs a little lot of love. I figured I could find something for the top, and it was going to need some sweat equity to look good. Plus it needed to be rewired since it appeared to have a very old plug. Easy peasy, I already had a wiring kit at home. I knew what I wanted to do with the lamp but hadn’t started yet. That is until my blogging tribe asked if we could all be ready for a $10 challenge in just a few days. Um, sure 🙂 So I got busy while the hubby was out fishing for the day. Here are all my lovely blogger friends who are participating this month. Follow along with #InspiredMakers and #InspiredMakersChallenge to see more amazing projects every month! Be sure to check out all their great under $10 projects in the links at the bottom. The challenge was for $10 and under and since I already had everything before the challenge started I knew I could finish it under budget. But in the spirit of the project I’ll do the math. The lamp was part of a bundle and with everything else I bought I’d say it was $2.00 (total steal). The globe cost $1.00, the connector was $1.95, and the 3-way stitch I needed to go with the light kit I’ve had for a few years was $4.95. Grand total of $9.90. First thing is to disassemble the lamp and remove the wiring. I didn’t take detailed pics of this process but table lamps will have a threaded metal rod up the center. 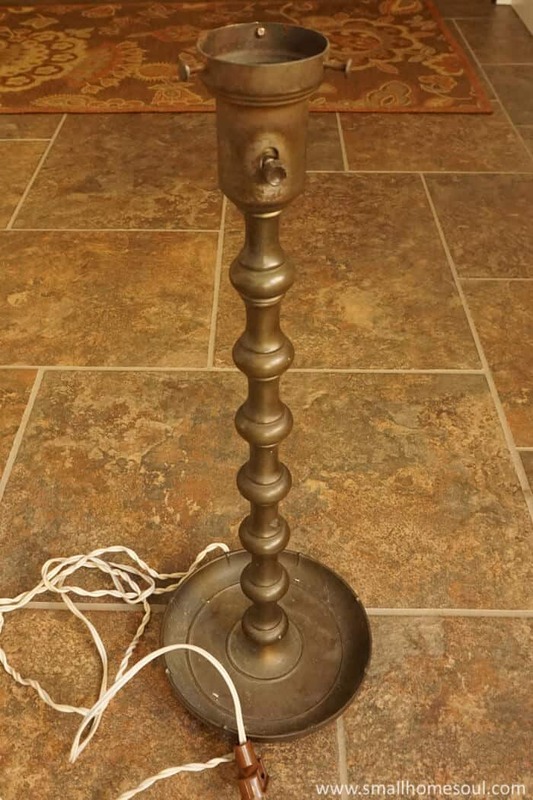 If you start untwisting the lamp from top and bottom it will start to loosen. Alternatively there may be a nut at the bottom where the cord is. Pay attention to how the parts come apart (or take pics with your phone for reference) so you can easily reassemble it later. The socket portion has a little screw that secures it to the upper threaded end of the rod. 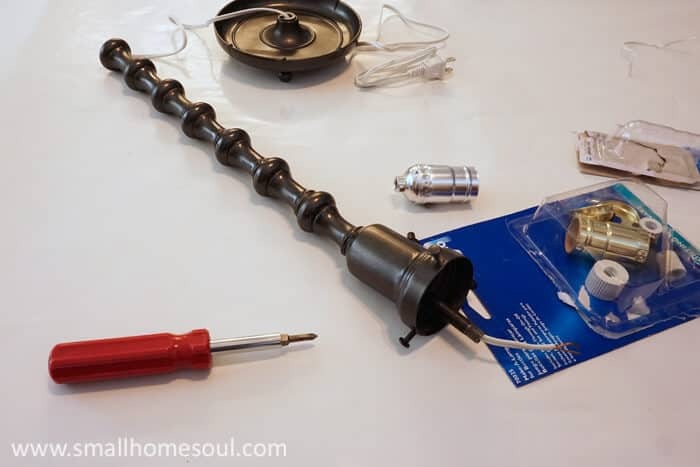 Cut the electrical cord at the base of the lamp then loosen the screw to remove the wiring completely. 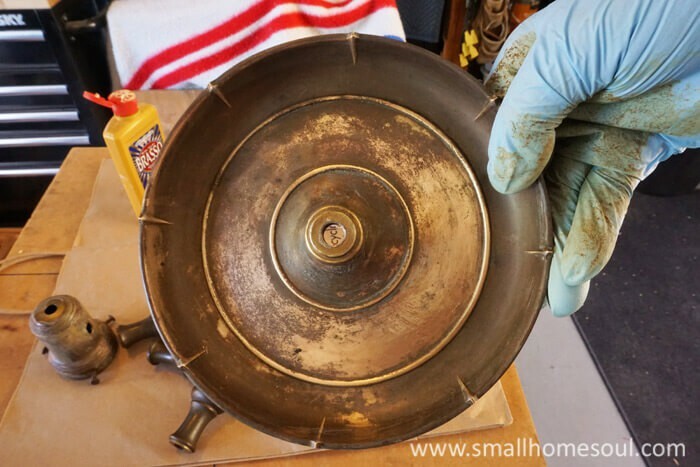 After the lamp is apart it’s time to clean it up with some metal polish and prep your brass lamp for paint. This is a messy job so make sure you wear your lovely and oh so fashionable blue gloves or you will be picking out tarnish sludge from under your fingernails. 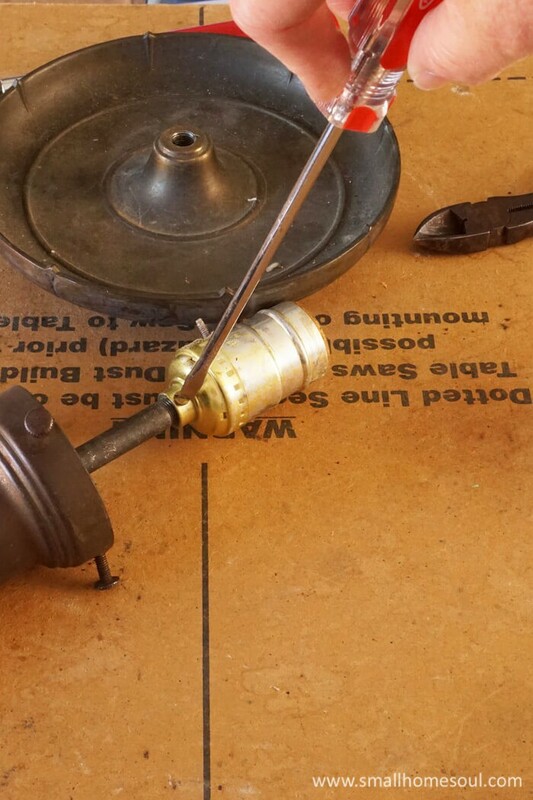 I started cleaning the base of the brass lamp using an old towel. An old towel worked perfectly when I revealed the beauty of a Brass Platter I polished. But after some serious sweat building I switched to a green scrubby. Not a new one but one that had been broken in and was more flexible to wrap around the parts easily. Since I was planning to paint my lamp I wasn’t worried about any surface scratches that might occur. The green scrubby worked great but in the end I did switch to using some steel wool to get into the nooks and crannies as much as possible. After you’re done cleaning the parts with the metal polish wipe them down with a clean towel. Then run them under water or use a wet rag to make sure no residue remains. After they’re completely dry it’s time to paint. Set up your Spray Shelter in your ventilated garage or on the grass. I propped up the parts over long screws on an old piece of scrap wood and gave them a few coats of paint. One day when I was walking the isles at Home Depot I perused the electrical isle. I knew the lamp base would take up to 2-3/8″ and I found that the neck of a terminal adapter would fit nicely. I hoped the other end would fit into the globe. With some modifications using my Rotary Tool I am happy to report that I was able to make it work. Here’s what I had to do to the globe and terminal adapter to marry the two together. Starting slowly I used a sanding circle to smooth the edges of the glass. As I got more comfortable I increased the speed of the tool and gave a little more pressure. 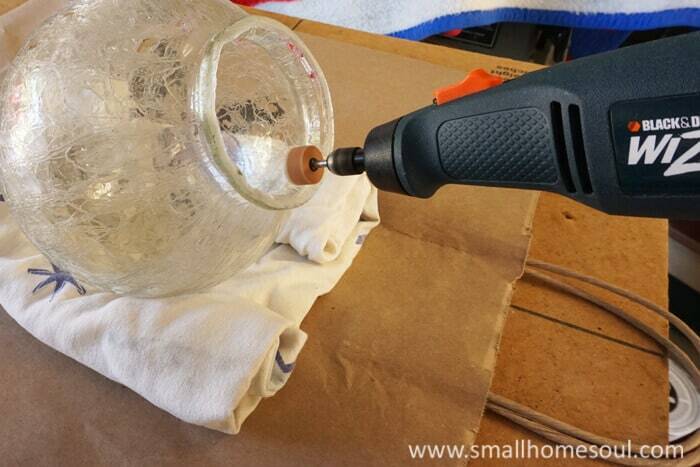 Avoid sanding in one place too long so that the glass doesn’t heat up. I didn’t want to break the globe I was working so hard to make work. Determine the depth that the wide end of the terminal adapter would fit into the globe neck. Mark it with painters tape, secure it in the clamp and use the rotary tool to cut and smooth it. I had to trim off the bumps on the outer side, the rotary tool made easy work of that. I smoothed the outside edge with the rotary tool so it would take the paint well. Trim the threaded end if necessary to fit into the lamp base. Paint the new globe neck to match the lamp. 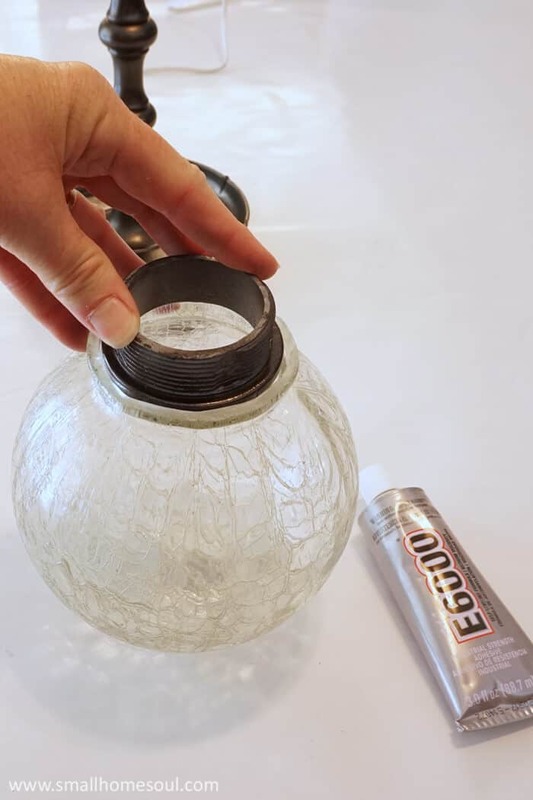 Secure the newly trimmed and painted terminal adapter into the globe neck with e60000 glue. I used a craft stick to smear the glue onto the edge of the adapter as well as the inside rim of the globe. 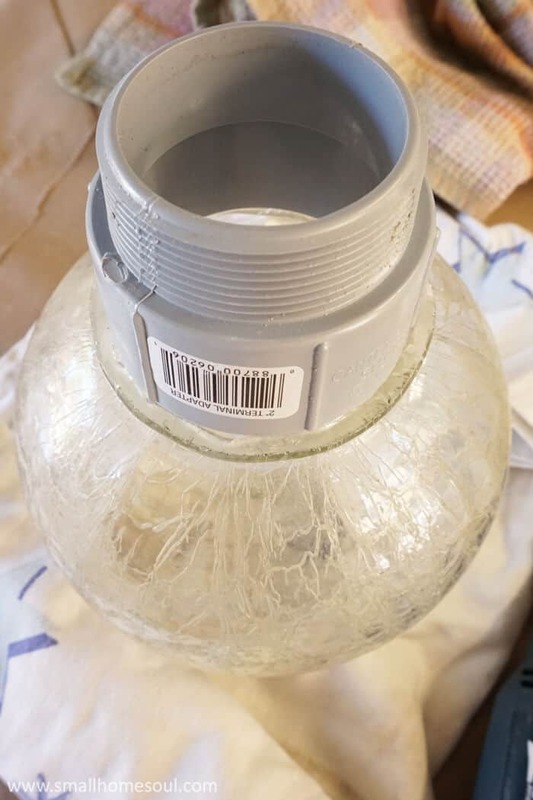 Make sure it’s in there level and let it cure for 24 hours. Lay out all your parts. Run the new lamp cord through the bottom of the lamp base and then through the center support rod. With the wires of the cord just visible at the top of the rod slide on the decorative spindles in the same order you removed them. Give yourself plenty of play in the cord between the base and the rod, you need working room. Pull about 1′ of wire out of the rod then slip the lamp neck (where the socket sits) over the wire and down near the other parts. Grab your new light socket and pull it apart. There will be 3 parts. The two outside pieces and the center where the wires are connected. Slip the bottom piece (like a little cup) down over the wire and set aside the outer threaded piece for now. Loosen the two screws on the center piece and loop one wire from the cord over each and tighten. Now slip this back into the outer threaded piece and lastly push the two outer parts back together. With the wiring completed it’s time to reassemble the lamp. Carefully hold all the parts together and pull the excess cord back through the base. I found that holding the light upside down worked best for me (your scenario might be different). With my lamp standing upside down I fit the base over the threaded support rod and screwed it on like spinning a plate on a stick. Once it was tight enough I turned it right side up and gave it a few more twists at top and bottom like wringing a towel to make sure it was snug. Now to add the globe and enjoy my new light. My dining room buffet has needed something with a little height and this works perfectly. I still need to do a little more to my sad buffet but for now this newly updated brass lamp is an improvement. Isn’t this the coolest affect? This is one of the smaller bulbs I mentioned. This bulb is clear and I also tested it with a frosted bulb. If you don’t like seeing all the crackles on the wall the frosted bulb is what you’ll want to use in your newly madeover brass lamp. 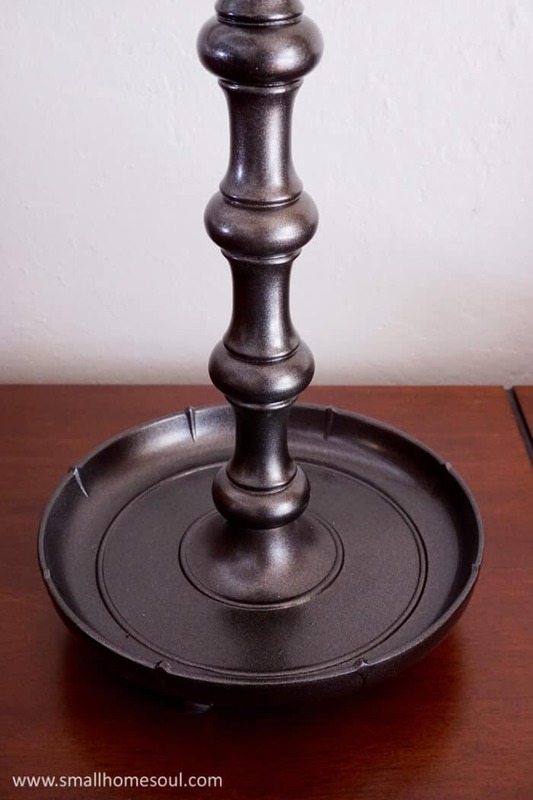 The bowl-shaped base on this lamp would make a perfect holder for jewelry in a bedroom. Or maybe some dried flowers or mossy balls to doll it up a bit with the seasons would be nice too. This lamp now looks great next to my Map Artwork. Now for even more Under $10 inspiration…. 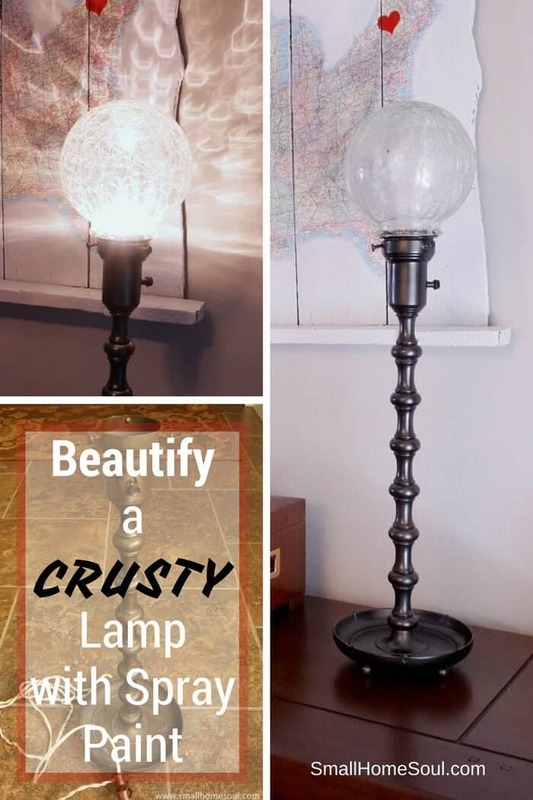 Wow, Toni, what an excellent tutorial on all the aspects of restoring and up-cycling this lamp. Makes me want to get one of those rotary tools and visit Habitat again! 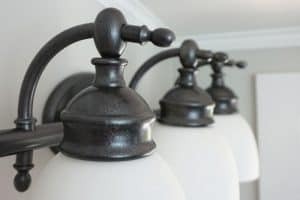 Toni…so much great and useful information in this post! And so glad you dodged the lightbulb crisis! It looks fantastic and I know you will enjoy that lovely light it emits. Great job! Your lamp looks fantastic! Thanks Tara, I’m so happy you think so too! 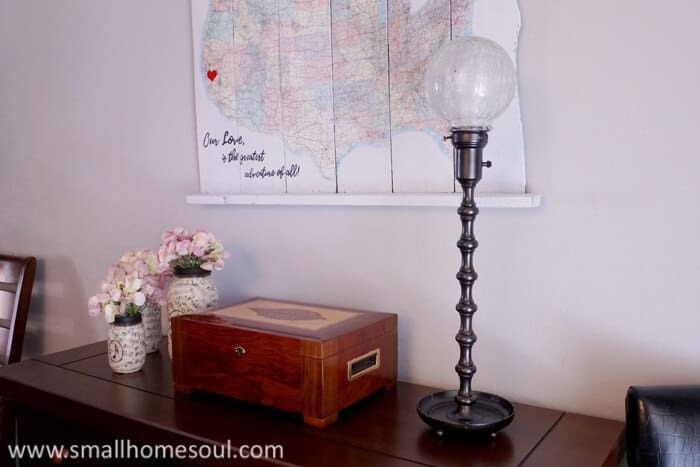 This lamp makeover is remarkable especially the lamp shade portion. Grinding glass off to make it fit is going the extra mile and did it ever pay off. Your lamp is gorgeous. Oh Leanna, I was so nervous that I’d get close to being done and then ruin it. I went very slowly at first with the roto tool seed and then got more confident but still was cautious. Had it broke I could have used a standard globe like for a bathroom, but it wouldn’t have been the same. I’m so glad you love it too! Thanks Jelica, and yes you do need one of those shelters. They are a live saver in winter and in windy areas like my house, there always seems to be a breeze to take my paint away. What a transformation! I applaud you for all the prep work you did. 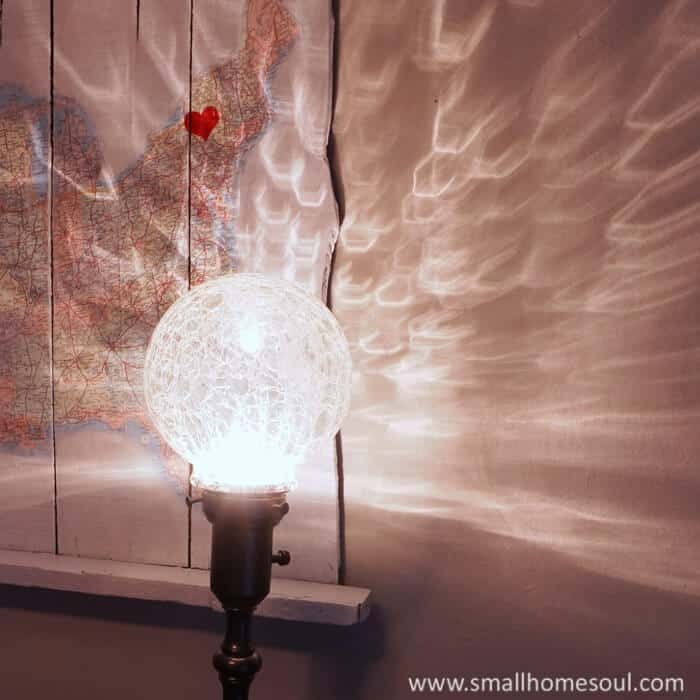 I love your globe and the pattern it casts when lit. Great project! Thanks Susanne, it was mostly sweat (literally LOL) equity. Toni, this looks SO good! Don’t you love that shelter!! ? Great job! Yes, I love that shelter. The bottom of it is a mixmatch of paint colors. Well used and loved. I’m glad you like my little lamp, friend. I just love lamps and this one is simply stunning! I love the transformation! Great work, Toni! Oh Carolann, stunning is what I was going for. I’m so happy you see it too! Wowzers! What a transformation!! 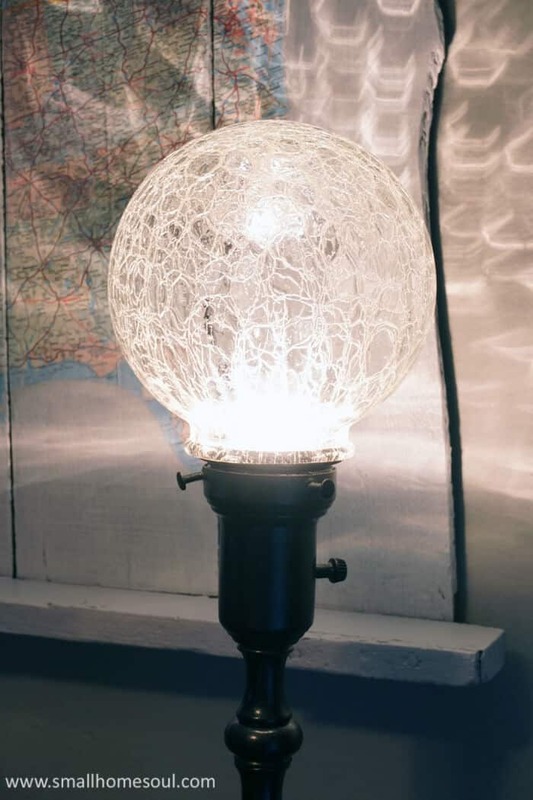 I love that you saw a project in an old sad lamp! Looks fabulous up there on your buffet with your cool map behind it! What a transformation Toni! Love the new finish. Thanks Kimm, I knew it would really shine with that paint. What a great find with such great lines. 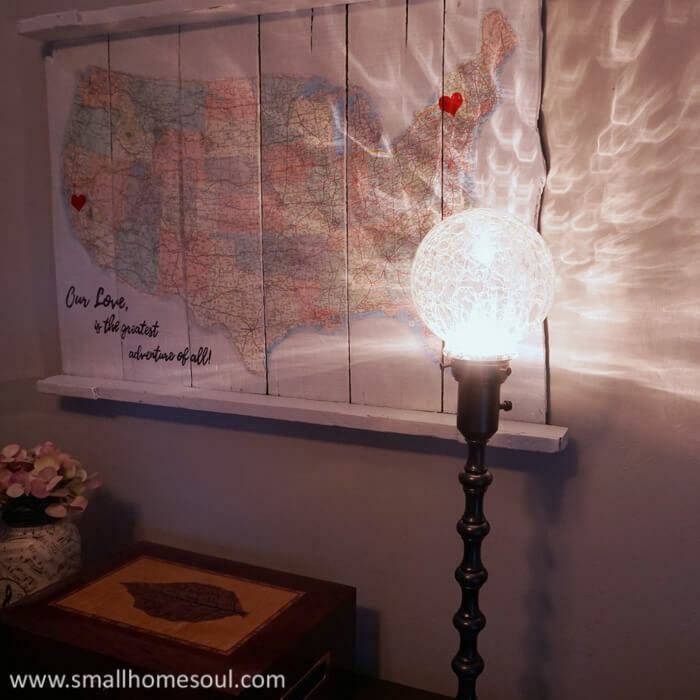 I love the crackle globe you added and the way it illuminates your space. Yes, I really love the delicate details of the spindles so much! Toni what a great project! You are so thorough in your tutorial! 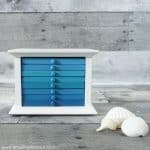 So many college kids or families on a budget could surely win with this project. I love how the light plays on the wall when the lamp is lit! Super unique look! Thanks Sue, I hope to inspire lots of people to see the opportunities out there for lovely decor at a huge discount.